We’ve been bombarded with snow storms every week for the last three weeks and still have plenty of snow on the ground as a result. The temperature dropped back to winter levels again after a warm stretch in February. But it’s time to start germinating seeds for a new season, especially those that need more time to grow, bear fruit and ripen. 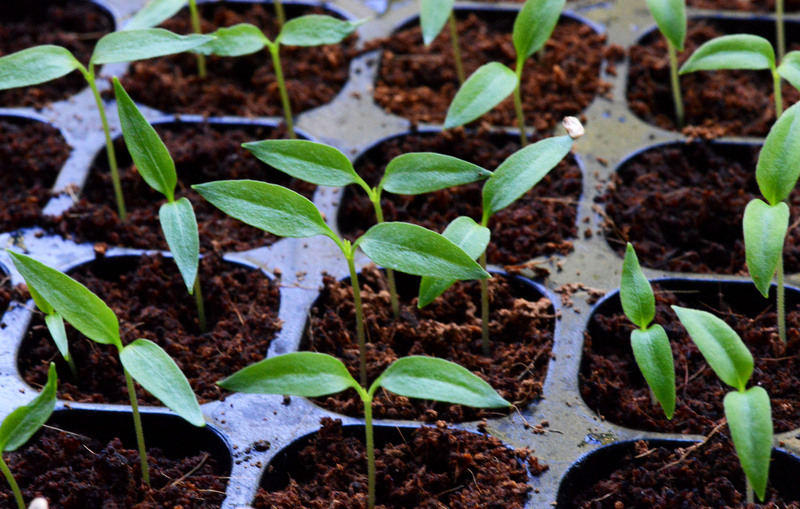 I started our tomato, pepper and eggplant seedlings last week. The tomatoes have already sprouted up. Chili peppers will need a little bit more time to sprout. 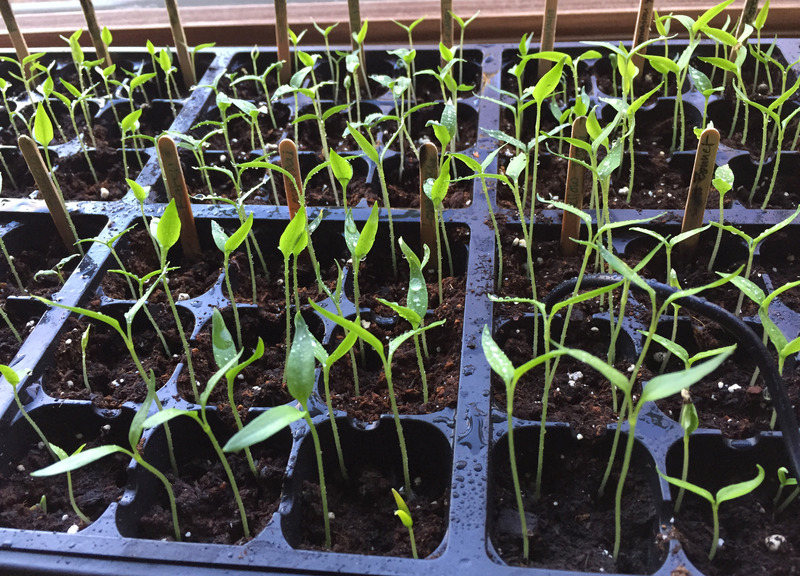 I started these tomato, pepper and eggplant seedlings on March 13 and all the tomatoes sprouted by March 17. I forgot to keep ‘Mortgage Lifter’ and ‘Rose’ tomatoes seeds last year so I used the ones left over from 2015 and they still sprouted at the same time as the new seeds. Peppers and Eggplants still take their time. 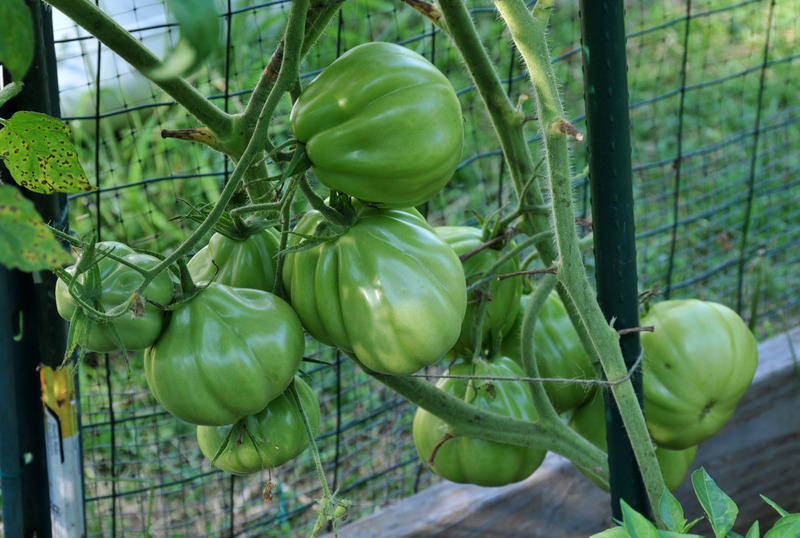 Aside from the usual tomatoes we have been growing, Brandywine, Cherokee purple, Mortgage lifter, Nova, Indigo cherry drop…among them, this year we will try two new varieties. I ordered True Black Brandywine and Dark Galaxy tomato seeds from Baker Creek Heirloom Seeds, one of my favorite plant and seed companies. I have never been dissatisfied with their seeds. This year we also picked a new variety of pepper to try, also from the same supplier, ‘Buena Mulata’ peppers. The description is impressive and hopefully we like it enough to keep it on our long list of chili peppers we grow. I also started varieties of kale and Swiss chard this week. By the time the last frost date comes, hopefully in mid April, they all should be ready to settle in to the garden. We agreed that the ‘Dazzling Blue’ kale we tried last year is worth growing again. If you like ‘Toscano’ or ‘Nero Di Toscana’, you will probably like this kale. It has similar leaves but with purplish/pink midribs and I find it’s a little sweeter. These Dazzling Blue kale are from last season, beautiful to look at and tastes delicious too. Hudson Valley Seed Library This is my local seed company that offers plenty of organic seeds in beautiful packages. I hope you find something you like from these companies to add to your garden. I derive no benefit or profit from suggesting them, just my experience from patronizing them over the years. I know it’s the middle of January but I also know that plant and seed catalogs start pouring in. Many of us comb through them and get that gardening itch. Like it or not, winter is a time to think about the next planting season, at least for me anyway. Looking back to see what worked well and what was a failure. Looking forward to see what new experiment might fruitfully improve the garden and what new plants to grow. 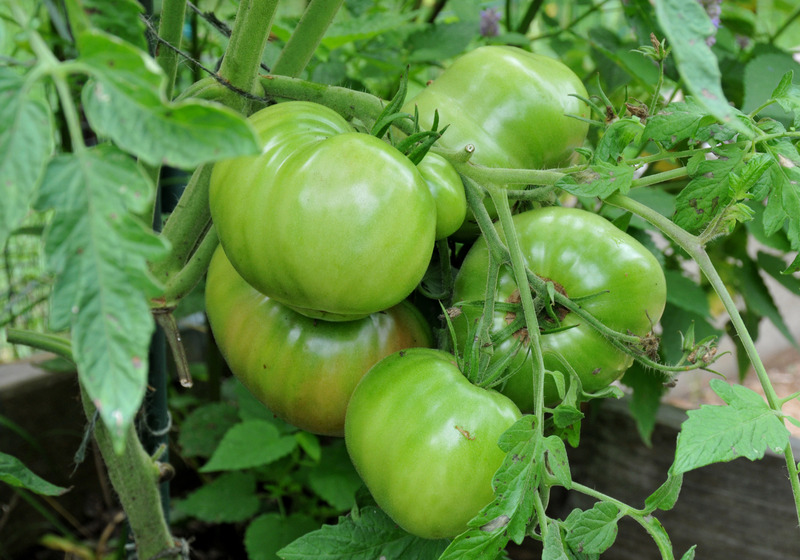 We love tomatoes and have been growing a variety of both large and small sizes. The challenge of growing tomatoes for me is keeping them straight up. I bought a variety of tomato cages early on but they never worked well for me. Most of the time they’re too short. My tomato plants grow over six feet tall and some years I have to get on a ladder to tie them in place. So I have been experimenting with ways to keep them from flopping over in the least amount of time. Tying tomato plants is a time consuming process. These are some of the varieties of tomato we grew last season. 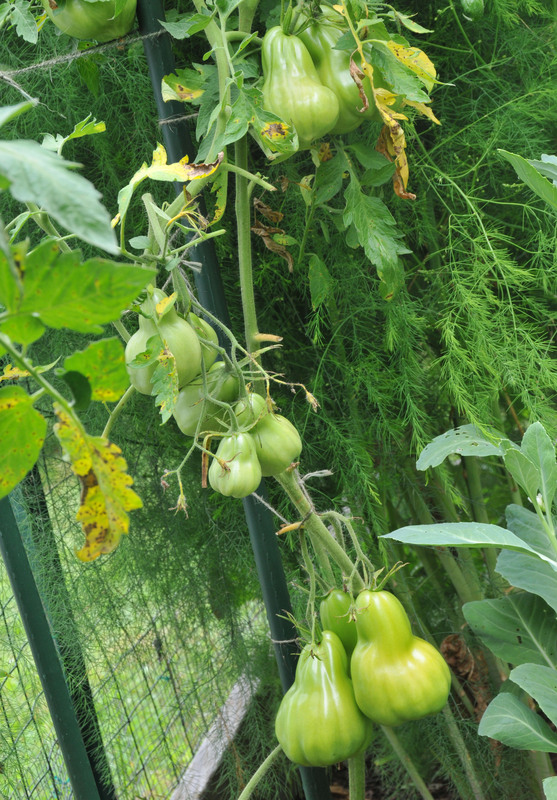 When the tomato cages failed, I used long poles to tie the main stalks up, then used some shorter and smaller ones vertically in between for the branches. This method worked well but risked damaging the roots when I pushed a new pole into the ground to support a branch. The tomatoes also flopped over when I failed to have enough time to keep tying them regularly as they grew. I also used a lot of smaller poles, too many of them, in fact. I had been using this method until last season. I experimented on a new method last season. I still use the longest and largest pole, 8 foot long, to tie the main stem to. 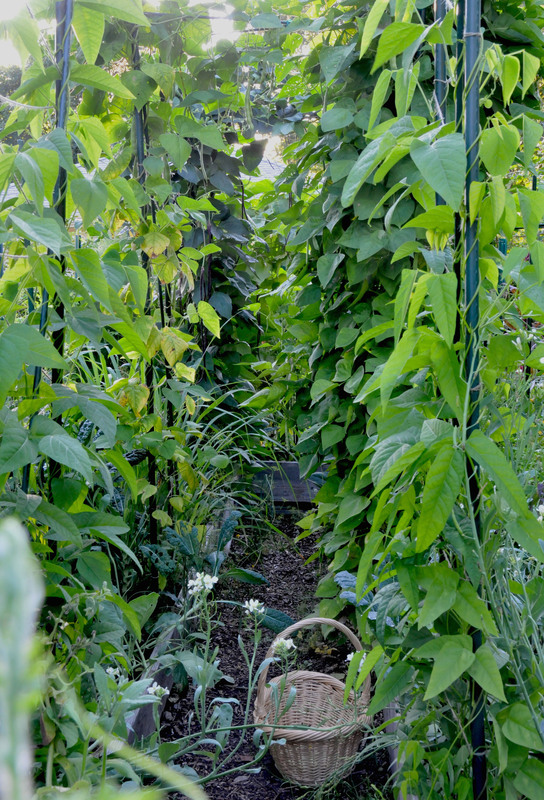 But this time I also put these long poles on either side of the plant, making a railroad track with plants in the middle. 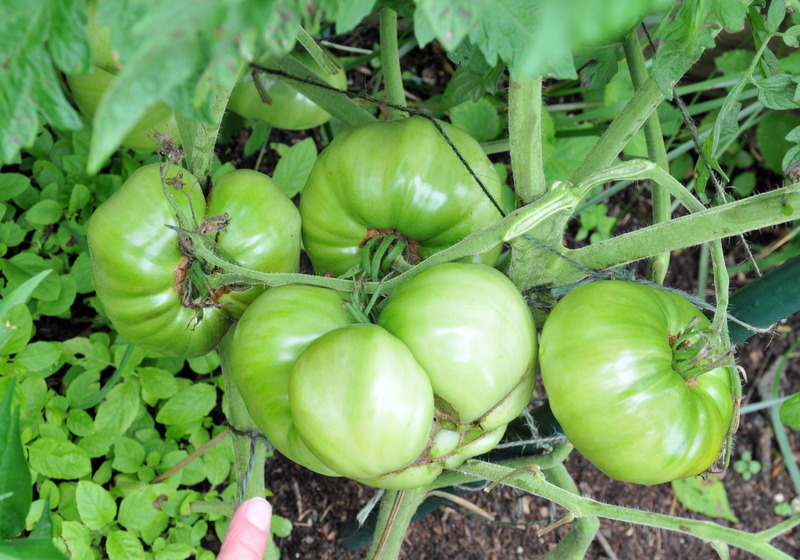 Each tomato has 1 foot by 16 inches in space. Then I tie smaller poles, horizontally, connecting each long pole together. I keep a foot of space between each horizontal bar. 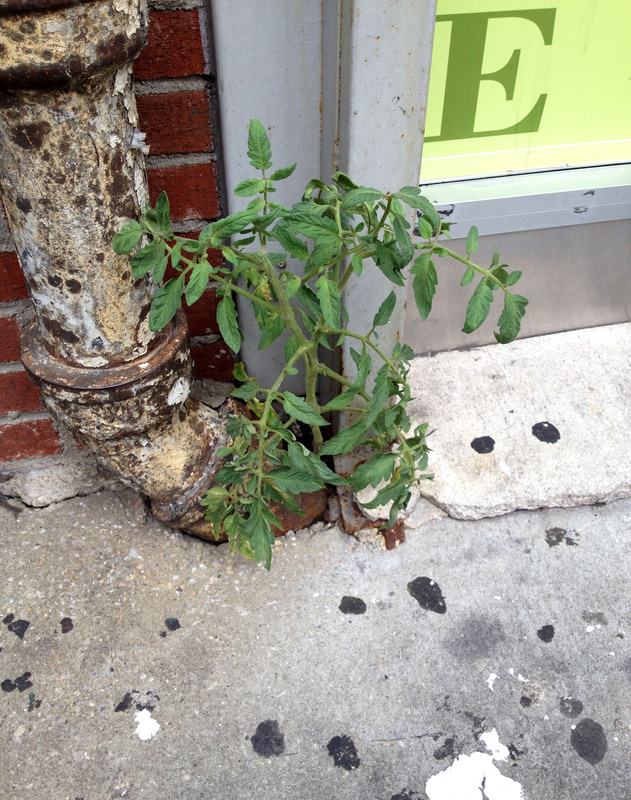 Once the tomatoes grow and branch out, I just tie their stems to these bars. Restricted to gardening on the weekend some weeks, the branches still rested on the bars, without flopping down. 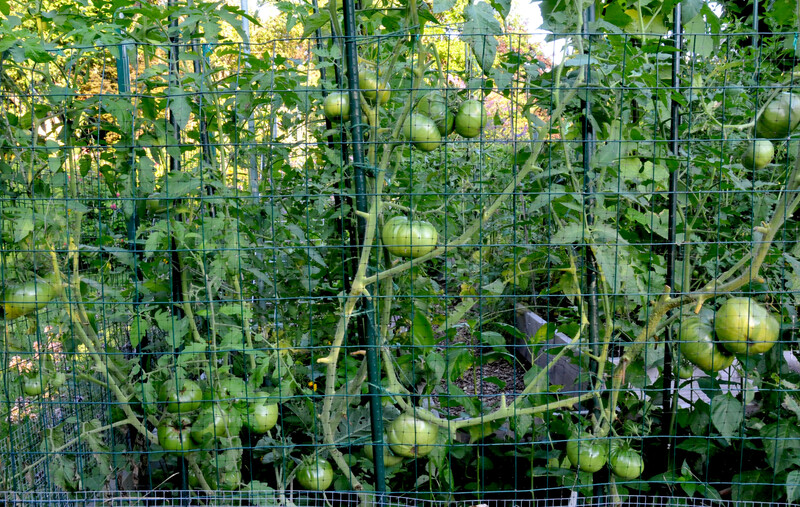 The trellis also worked well for large tomatoes. On the far left are ‘Tie-dye’, then ‘Brandywine’, ‘Cherokee Purple’ with ‘Mortgage Lifter’ at the far right. 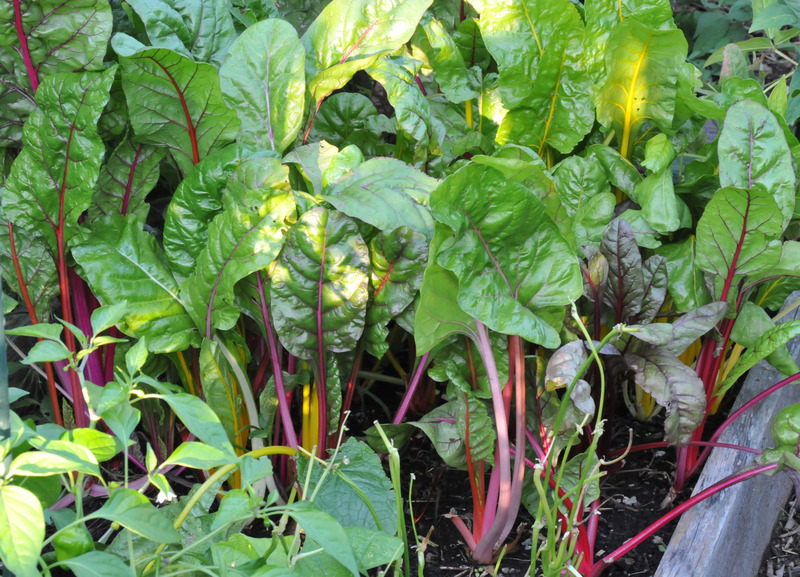 At the end of this plot is Swiss chard and Kale. One mistake I made was to use thinner sticks for some of the bars. I ran out of the the sturdier ones so I used the ones made for hoops in their place. They bent way too easily under the weight of large tomatoes. When I installed the correct size pole, it worked well. The larger tomatoes, some over a pound, can rest on the bar as well. These Brandywine tomatoes, most either over a pound or close to it, are resting on the bar. I tied some of the fruit stems to the bar as well, to support the weight. At the end of the season, once I cut all tomato plants down, I untie the poles and put them back in the toolshed. That saves a lot of space. 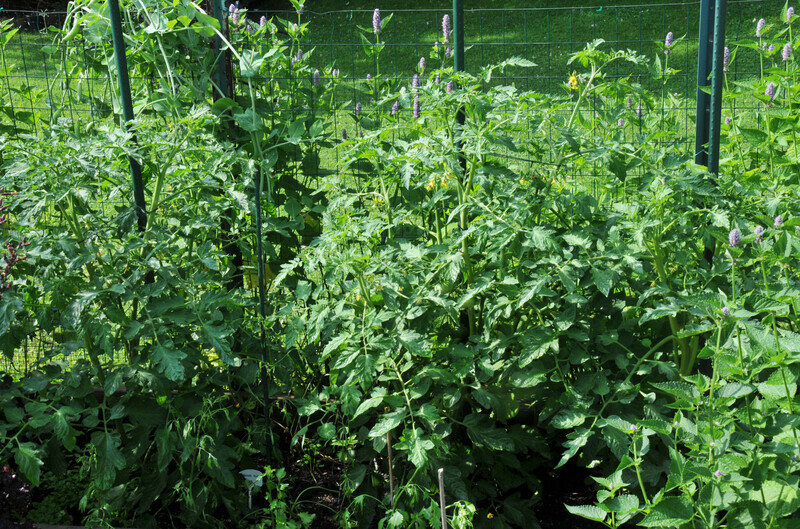 I can always shrink or expand the trellis according to how many tomatoes I grow. Tomatoes and chili peppers are a staple in our vegetable garden. We love trying new kinds of tomatoes for both color and taste. Once we find the one we like we cull seeds to grow the year after. Four kinds of tomato we have been growing every year because they have a marvelous taste are Cherokee purple, Mortgage Lifter , Brandywine and Rose. 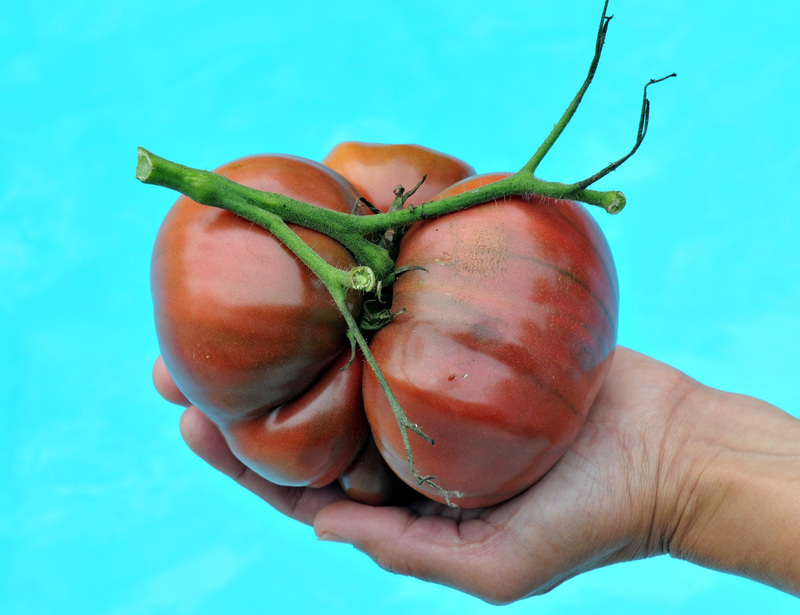 We fell in love with the Cherokee purple at first bite, with its thin skin, juicyness and full tomato taste. The rest are big, meaty and tasty. We vouch for these four tomatoes anytime we’re asked. We let the cherry tomatoes self-sow year after year. I have no idea what type of cherry tomato they are, but they’re very sweet. At this point I should call them ‘Resident Tomato’ since they seem to come up by themselves all over the yard every year. We both love spicy food hence the collection of chili peppers. I try to add some new kinds of chili pepper every year. Some are harder to grow than others. And, growing chili peppers in a cold climate is a challenge. Growing tomato and chili pepper in the Northeastern part of the US takes some good planning since the growing season is a little bit short for some them to grow, bear fruit and ripen. 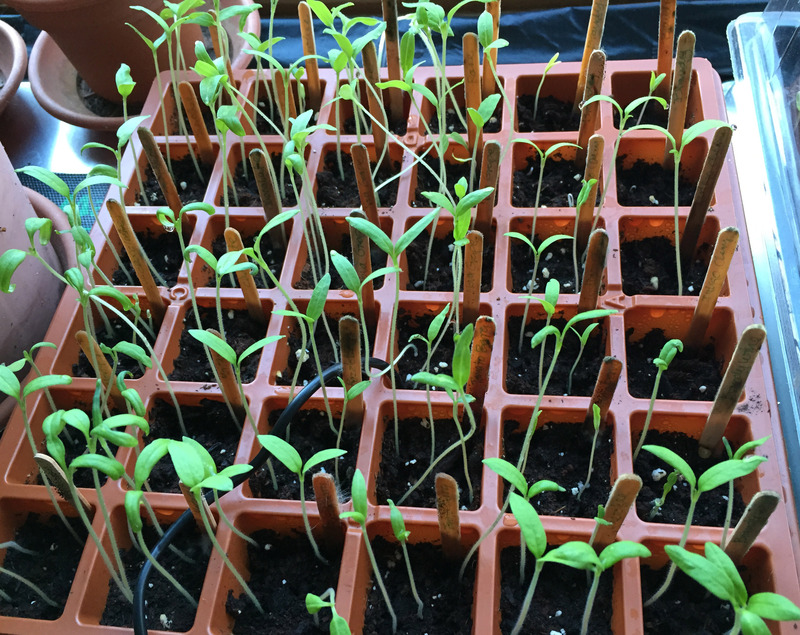 I have learned from vendors at the farmers market that the tomato and pepper plants they are selling were germinated in early March. So, I have been following their method. 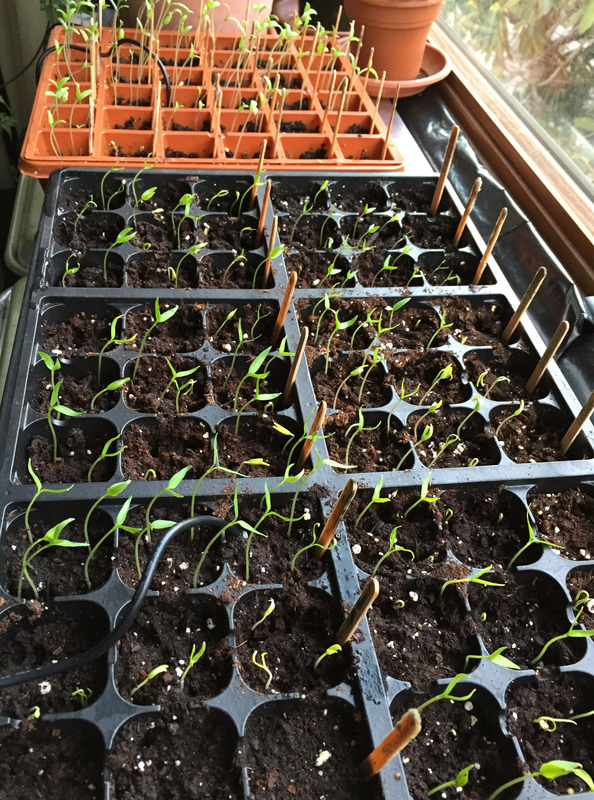 This year I started my tomato and chili peppers on March 8, never mind the snow and freezing cold out side. I put seed trays on heat mats set to 80° Fahrenheit by the bay window. Natural sunlight is enough for now and I don’t have room in the basement to add trays there. It’s too cold down there anyway. Some tomatoes sprouted within 5 days but the chili peppers take a little bit longer. I usually see them sprout up within a week, providing that the heat mat stays between 75 and 80 degrees at all time. Now I have to wait for the true leaves to come up before I can put them in their individual pots, should be one more week now. I forgot to put baby bell and Shishito peppers in, so I will have to buy the plants for this season. They are very mild and good for snacking. I may be able to start the Shishito now though since I will stir-fry the peppers when they still green, no need for maturity. The gourmet growing season has begun! 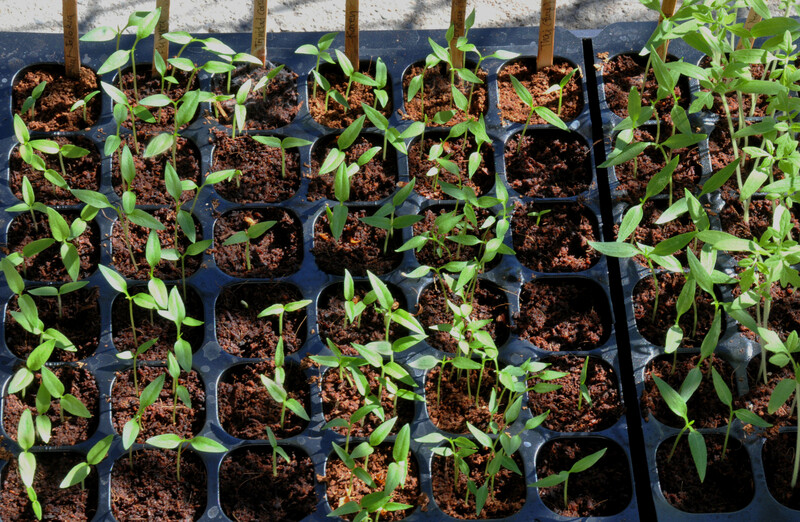 I usually start seedlings of any plants that need longer time to mature in the house not long before I can plant them outside: Chili pepper, tomato, Bitter melon, Moonflower and a few more. I put them right in their permanent spots in the garden when they have developed their true leaves (the second set of leaves). When it gets too chilly I just cover them with plastic cups or soup containers. It’s been my normal practice until this year. The cold weather has lasted longer this year so I had to adapt my method of planting otherwise the plants will not have enough time to produce anything but leaves. I started chili peppers, tomatoes and Anise in mid-March. The 48 cell seed starter tray is a perfect tray to use for this job. 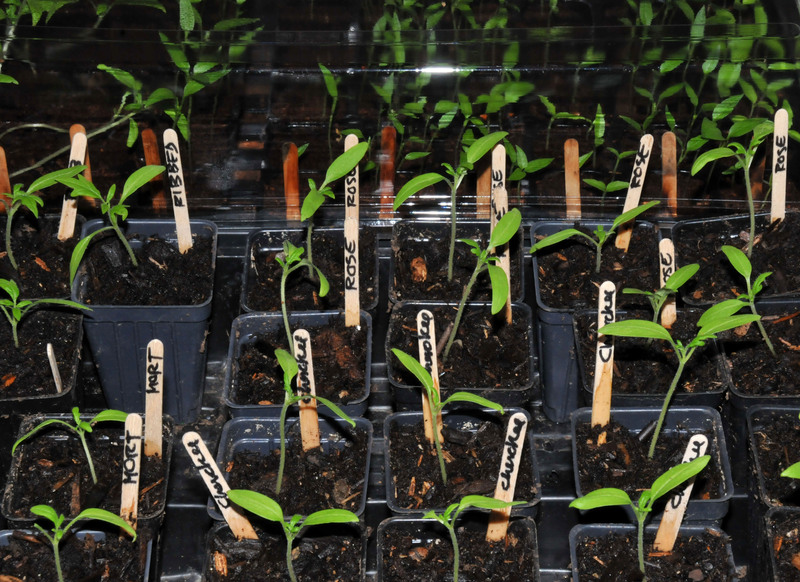 I put 3-4 seeds in each cell and put the tray on a heat mat that I set to 80º F. Most of the tomato plants sprouted in about 4 days, followed by some of the chili peppers. Then came the part I always skip, putting them in their individual pot when they develop true leaves. I know if I put them in the ground at this time, even with plastic cups over them, they will die. 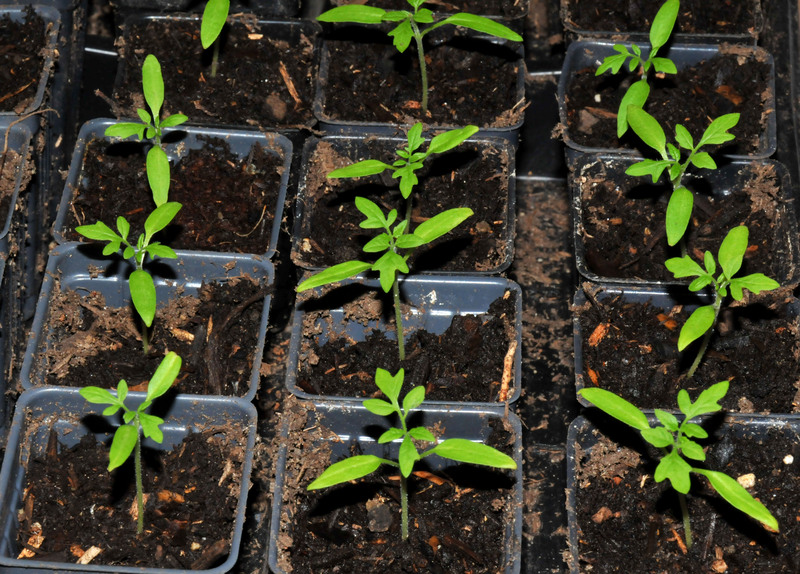 So, I separated the tomato seedlings and put them in their individual pots in the house. When it gets a little warmer outside I will put them in the cold frame to harden them before I put them in their permanent spots or give them to friends and colleagues. 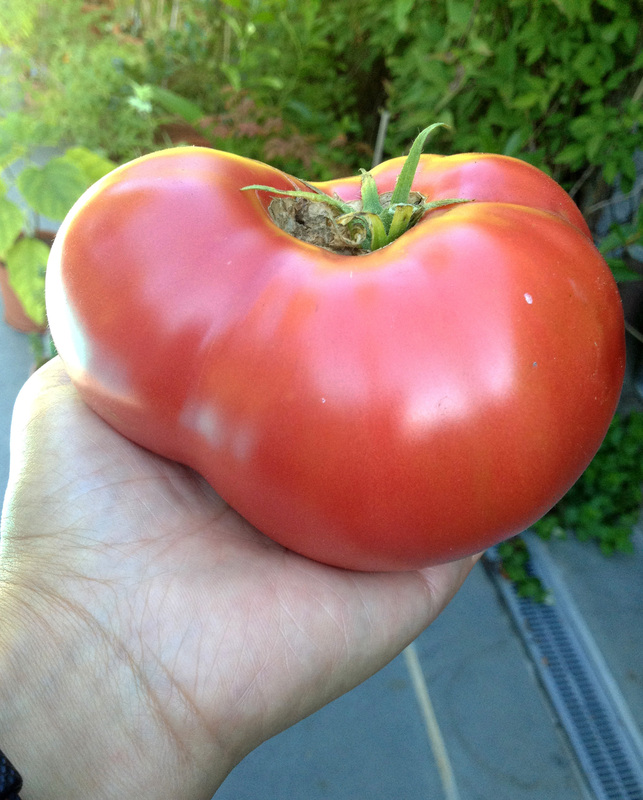 As for large size tomatoes, I grow the usual ones: Mortgage Lifter, Rose and my favorite-Cherokee purple. The ‘Ribbed’ one, I have no idea what it is but I love the taste so I kept the seeds to grow this year. I’m still waiting for some self seeded cherry and grapes tomatoes to sprout in the garden. They are late this year due to weather. Our vegetable garden this year is very different from last year. 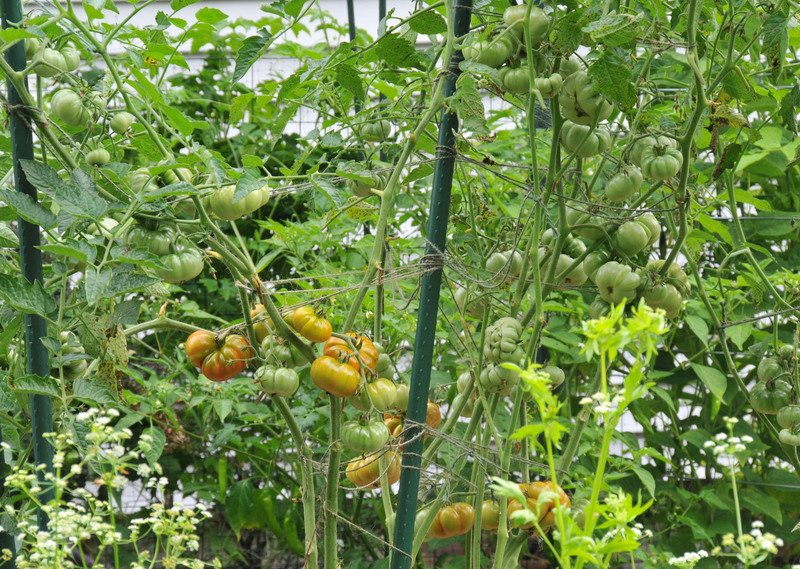 We had a lot of cherry tomatoes last year from seeds that sprouted up in compost I used. There are not many of them this year as I’ve pulled the sprouts out early before my guilt set in. I just can’t bring myself to demolish a perfectly good plant. I didn’t expect the uneven weather we’ve had that caused a lot of the tomato flowers to drop and the fruits to grow very slowly. Beans, Kale, Broccoli and Swiss Chard are doing well though. I can’t pick them fast enough. August is here and the temperature dropping close to 50°F for a few nights has not helped either. What happened to summer? I’m debating whether I should sow winter vegetables now or wait until mid-September as usual. 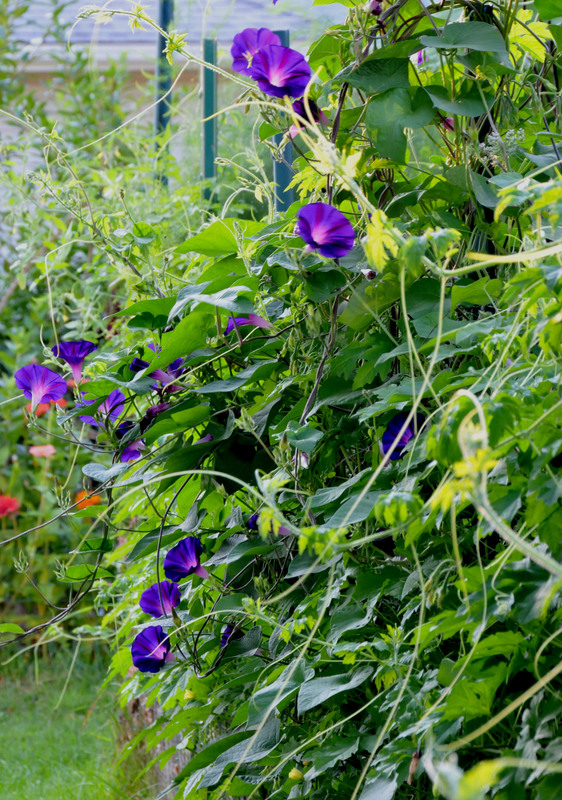 I have no idea how this Morning glory got here but I let it grow since the flowers are so beautiful. The Bitter melon doesn’t seem to mind sharing space on the fence either. Winged beans in the foreground are just starting to flower. 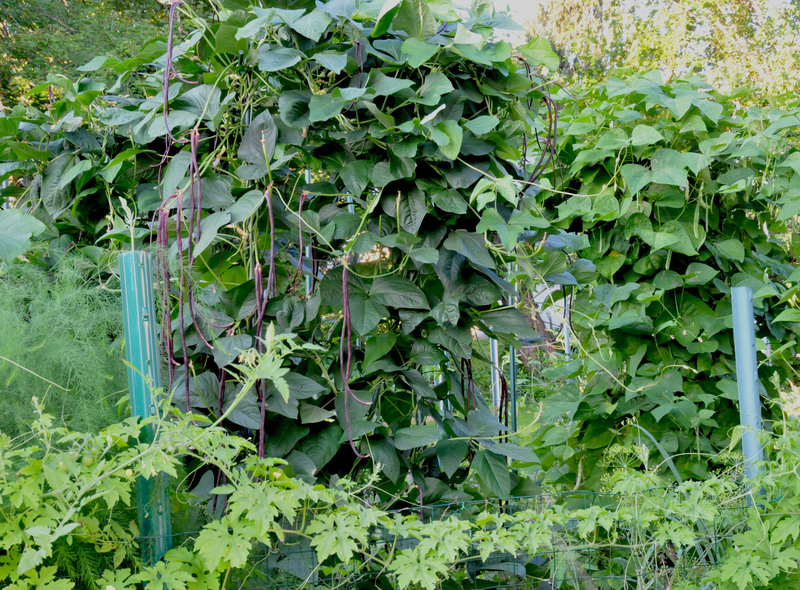 The Italian and Asian long beans in the background have been producing a lot of beans this season. The lush Red Asian Long beans and Italian beans are growing faster than I can harvest. Sad looking tomatoes. I had to cut most of their leaves off when black spots started to grow after raining continuously for a few days. 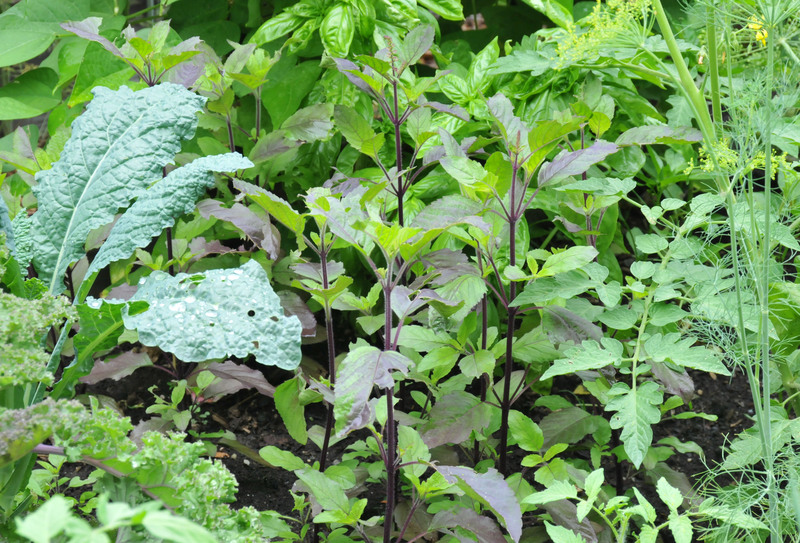 Holy basil are doing fine amongst the Kale, Dill and Genoese basil. I promised myself to be tougher with self-sown seedlings this year. 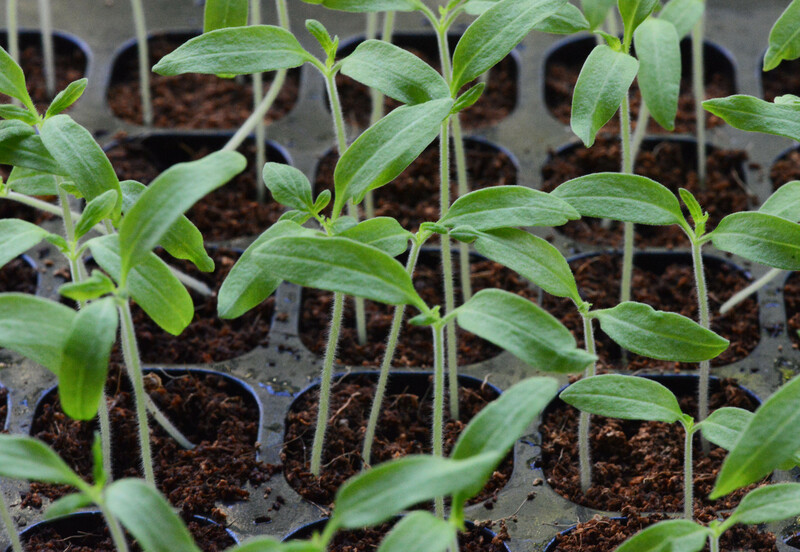 Last year we returned from vacation to discover plenty of tomato seedlings in the vegetable garden. They were very healthy too, so I dug some up and either gave them to colleagues or replanted them in my neighbor’s garden. I let some of them grow and that posted a big problem. They took over the garden. I have a solid plan this year: only the seedlings I started in the house will have their space in the garden. I settled with twelve seedlings for each tomato: Mortgage Lifter, Cherokee Purple, White Tomesol, Rose, Aunt Gertie’s Gold and grape tomatoes. They came up four days after I put them in the coconut planting medium. I waited for the tomatoes to produce true leaves, the second set of leaves, before I put them in individual pots. I know there will be seedlings from our compost corner and I use them so I didn’t start any cherry tomatoes. The chili peppers have taken a little bit longer to germinate. I’m growing a few more varieties this year: Bhut Jolokia, Congo Trinidad, Chocolate Habanero, Caribbean Red, Sikkim chili, Lemon Drop, Purira, Punjab, Nepalese Bell (a colleague gave me fresh seeds), Karen (Golden Triangle tribe)chili, Bird Dropping (smallest Thai chili), medium Thai chili, and Long Thai chili. They are very slow to grow since I didn’t use a heating pad this year and the only light they get is through the living room bay window. If I’m home on the day the temperature has gone up above 60°F, I would take them outside to get real sunlight and harden them up a bit. I hope to be able to put them in the garden in the middle of the month. Tomato seedlings a week ago. They are in their individual pots now. Chili pepper seedlings just starting to produce true leaves. I hope to be able to put them in their pot in the next few days.